Even though we've been having mild Winter, I surely wouldn't mind being zapped into this scene. 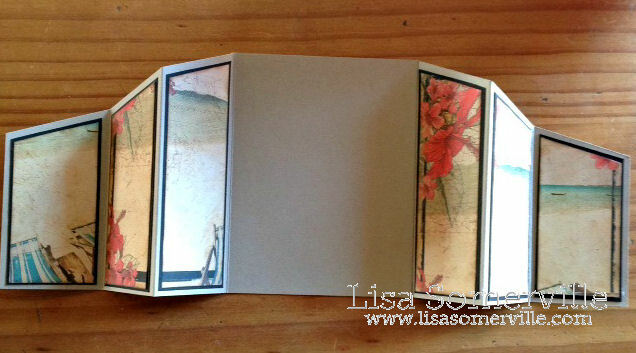 I created Accordion Fold using two panels of 5.5" x 10-5/8" card stock. I scored the panels using the Scor-Buddy, scoring at 2-1/8", 4-1/4" and 6-3/8". The Scor-Buddy works wonderfully for creating these score marks, since these measurements are already marked on the board with the Dot, Asterisk and Dot. Here's the two panels embellished with card stock and pattern paper from KaiserCraft. Adhere the two center panels over each other as shown above, then stamp and embellish as desired. The beautiful Palm Tree image is from Our Daily Bread Designs Happy Retirement set. The image is stamped in Black Archival on a piece of KaiserCraft pattern paper, then colored with a combination of STAEDTLER Karat Aquarell Watercolor and ErgoSoft Colored Pencils, blending the colors with Gamsol. I added clouds to the background by sponging Blue Ink around a Scallop edge. The sentiment is from The Sea Mini set from Our Daily Bread Designs. To further embellish I added some Fish Netting and Shells created with STAEDTLER Fimo Clay and Push Moulds. I'm entering my card into the Simon Says Stamp and Show Challenge - What are you Known For. I'm a layer girl, and usually add 1/8" Black (or Chocolate) layers to my projects. I also use a lot of pattern paper, and love to sponge the edges! lovely Lisa - I agree - enough of the cold! This is a wonderful project, love all the folds and artwork! Love the accordion structure, works so well for the tropical panorama - oh, please, can we all go?! Great card, love all the folds. And yes, being transported to a tropical isle sounds great today! Here's a first...I get to comment for you...lol! I'd like to be in this scene too...gorgeous! 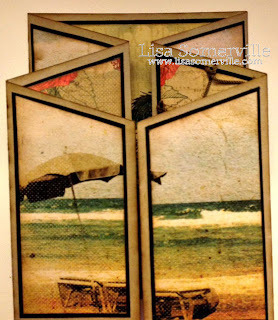 Love the many panels and more beautiful scenes...I can feel the heat coming off the sand! You are a layerer, and I like that! Fab work as always! Thank you so much for playing along with us this week at Simon Says Stamp & Show! I love the fold and your use of it with the stamps and papers is perfect!